I’ve become a fan of Heroes, an ongoing series by NBC. Interestingly enough, I time shift, medium shift, and control the content in the way I want to. The first season, I didn’t watch on TV, we rented the episodes from the local Blockbuster (not online). For season 2, which just started, I’m watching the episodes online from the NBC site. The have pre-roll ads, that are about 30 seconds, which you cannot fast forward. The advertising videos are actually interesting, as they change them up for different sponsors and there are links to learn more. For example, last week, there was an interactive game in addition to the video for a new Nissan crossover. This week, Bertolli is launching a frozen dinner product, and there are links to video recipes, very interesting. After the spot plays, the user is required to click on the add to advance. 3-5 times during each episode a 30 second spot is run, which I can’t fast forward. In return, a few 30 second spots, that are related to my interest don’t bother me at all, although I would prefer if I could select (rate and comment too) the types of commercials I want to watch, increasing the opportunity for the message to be on mark. Most of the control over TV medium is now in my hands, although the 30 second spot doesn’t seem as intrusive. The web and TV continue to intersect, with the control moving to my hands, the savvy media brands realize, embrace and change. Google announced that it’s going to imprint a tracking algorithm being referred to as a “fingerprint” on video media for it’s video systems (Google Video and YouTube). I had conversations with colleague Jeff Scott over coffee, and we came up with some interesting risk analysis. While the media industry breathes a sigh of relief, what are the business and user impacts for such a system? 1) This finger printing system, which is likely invisible to users, could decisively leave small pixels that could eventually be added to create a unique identifier. Sadly, there’s no security system ever that is fool proof. 2) For Google, this could be a media lock in process. Media companies that want to play on the world wide web would go through Google to submit video and for it to become imprinted with the fingerprint. 3) With trust increasing for online distribution, Google will become the IPTV player of choice, furthering it’s mission to organize the world’s information –and generate contextual advertising dollars. 4) Google becomes the cop, and has the power. As Google builds the security system, they become the single police force, and continue to maintain more control. What should Media brands consider before jumping onto Google’s priopriatary security system? Seek other forms of fingerprinting and watermarket, and consider deploying video on other platforms, not just on Google. I expect other video fingerprinting systems to appear that can be leased or sold to media companies, giving more control over content. So before we embrace the much needed tracking system, let’s first look at the impacts it could have on online media, although dominant, Google is not the only video platform to consider. That’s the quotient that online video people are trying to figure out. Well Ustream has launched a new tool in their latest version that lets users ‘shout out’ about a show that’s interesting, their blog lists out the details. What’s Engagement? I’ve discussed it several times, and have been able to boil it down to “Apparent Interest“. My formula suggests it’s the factor of Attention, Interaction, and a few other attributes. Colleague Robert Scoble has a video interview with the CEO of Ustream, and Techcrunch has the feature breakdown. What’s interesting about Ustream, a company that I’ve decided to advise? Well John Edwards was using it live on Monday after the debates, Chris Pirillo has a live show, and even Andy Beal has a weekly show. If you know about what I did at Web 2.0 expo, we really made an impression, and even used it on our panel. I’m waiting for buddy Allen Stern to start one! In addition to asynchronous content, the web is moving to real time. Killer App suggests that a new generation of online video aggregators are appearing, MSNBC has a great article by Ramon Ray that gives some resources on how to enhance your website with video. Communicating with your customers through video can offer them a fresh alternative to basic text on a static website. We all know the saying, “A picture is worth 1,000 words.” The principal is the same for a video on a website. I would also suggest that video is great for executives, and I’ve listed out some resources on Why Online Video is good for your Corporate Executives and How to Deploy. You may know me as one of the guys that was live streaming the Web 2.0 conference in 2007, this is a space that I’m watching grow quickly. I like lists, it helps me to keep track, gauge and watch a market. I’ve done this for a few other industries such as Online Data Storage, Social Media Measurement, and White Label Social Networking products. I’m starting to see more and more companies emerge that offer Online Video Web Streaming. The requirements? It should be accessible by the average consumer, no or low-cost, and transmits video through the web. It should be MORE than just a webcam software or home security, it should have features such as social networks, widgets, and archiving abilities. With kyte you start your own broadcast network! Webcast Your Event… Get the Power and Reach of a Radio or Television Broadcast at a fraction of the cost! While searching for more video lists, I ran across this great list. He’s got some other companies listed for scheduled broadcasting and remixing, but I’m primarily focused on live streaming. I’ve got a few he doesn’t and he had a few I didn’t. I love how the web promotes sharing and collaborative learning. It’s May 2007, and there’s five on this list, I predict there will be at least 20 of these types of companies on the web by the end of year. I anticipate that Google or it’s YouTube acquisiotion will launch such a service by Thanksgiving of Christmas (when people want to talk to family remotely). It does seem like everytime Google swallows a company that it has little innovation for sometime, so we’ll have to see. What’s the future of online video media? While video blogs are certainly getting more popular, streaming will too. I see social media moving from asynchronous to real-time. As our culture catches up to Asian countries usage of mobile, we’ll start recording and distributing more live video from cell phones. Help this list to grow, so leave a comment below. Update: May 29th, I’m excited about Ustream and have now joined the board of advisors, details on this post. 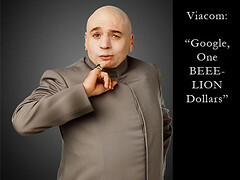 Viacom sues YouTube for “One Beeeelion Dollars” reports the whole world on Techmeme. Yes, too late John, too late.